A good mix of convenience and capability. Looks and feels like a typical kitchen appliance. Recommended for: If you’re looking for maximum control, you probably don’t want an electric model. But novice roasters will find a lot to like about the Behmor 1600. Are you tired of the same old same old where your morning coffee is concerned? Are you looking for a way to get even more flavor out of every cup you drink? If so, then you may have considered roasting your own beans. Take it from us, the first successful batch you roast will make you a believer – and you’ll never go back to store-bought coffee again! It’s a process, and yes, there is a bit of a learning curve. But it’s nothing you can’t master with a bit of time and practice. In the in-depth Behmor 1600 review that follows, we’ll take you on a guided tour of the machine. It might just be what you’re looking for, especially if you’re just beginning to explore the world of roasting your own beans. 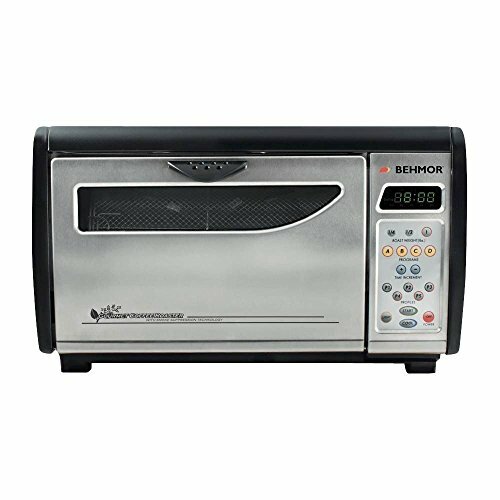 It offers a fantastic mix of convenience and capability as it’s easy to use and easy to master, while allowing you to roast a relatively large amount of beans at a time. True, there are other home coffee roasters on the market that give you more fine-grained control. But if you’re just starting out, then what you’re probably looking for is something that you can start using almost immediately and will give you good results on your first try, which is exactly what this model excels at. 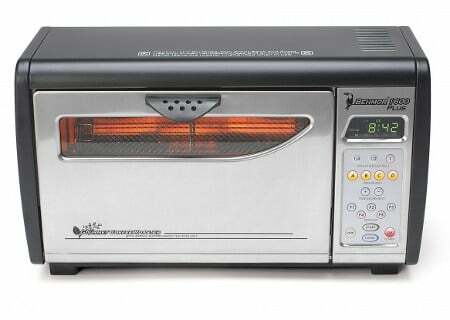 At first glance, the Behmor 1600 coffee roaster looks a lot like a conventional toaster oven. That’s an appliance most people already have in their homes, and it creates a psychological link that automatically makes the 1600 more relatable. While it would be a stretch to say it’s an attractive device, it’s certainly not ugly; it just looks like a typical kitchen appliance. It doesn’t take up a lot of space, measuring 9” x 9” x 15.2”. As such, it’s no particular challenge to find a permanent home for it, even in kitchens with limited counterspace. It only weighs 24.2 pounds. So, even if you find yourself having to move it around from time to time, that won’t be especially difficult either. Our Behmor 1600 review wouldn’t be complete without calling special attention to the machine’s raw capacity. On paper, it allows you to roast a pound of beans at a time, which is impressive. Most of the other home roasters can only handle four to eight ounces per batch, which means you’ll have to spend more time roasting to get the same quantity. If you’re a casual coffee drinker, that’s no big deal. But if you’re a power drinker, you’ll find yourself liking the 1600 very much indeed. In practice, you’ll find that if you try to roast a full pound in one go, the machine will struggle. And you’ll get suboptimal and somewhat uneven results. Even so, if you ease off slightly, and stick to about twelve to fourteen ounces per batch, you’ll be just fine. That’s still significantly more capacity than most other home roasters offer, and again, is something that makes this model stand out. This model offers five preset profiles you can use, depending on the type of beans you’re working with and what roast you’re looking for. 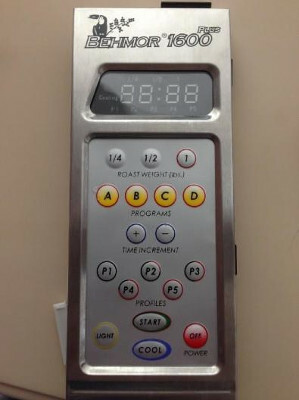 You can control your roasting times, temperature, and even cooling times via the +/- buttons on the front face of the machine. And you can interrupt any profile or roasting process by pressing the “Cool” button, which automatically places the machine in cooling mode. Note, however, that these changes are not automatic, and the manufacturer recommends that you think about fifteen seconds ahead to account for the time it takes for the machine to adjust to your input commands. In practice, most users who are serious about getting consistently good roasting results wind up taking a pass on the presets and opt to control the entire process manually. This makes sense, because again, the machine is definitely not “set and forget.” You can’t just toss some beans in and walk away, only checking back in when the process is done. In truth, there’s no home coffee roaster that works like that. It’s a hands-on process, so you’ll need to stay close to the machine while you’re using it. Since you’ve got to do that anyway, why not just take complete control? Note that if you opt for taking manual, end-to-end control over the process, the user manual has some helpful tips and guidelines to get you started. The company has made consistent, incremental improvements to the manual programming features, and you can really get surprisingly good results by following their recommendations closely. Then as you gain more experience using the machine, branch out and experiment on your own. Another solid feature is the 1600’s smoke suppression technology. This is much better than average. 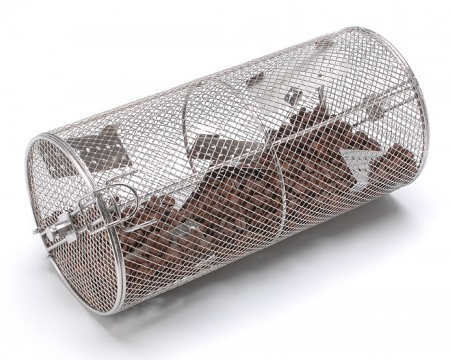 Although, no coffee roaster can completely eliminate smoke. Our recommendation is that you turn on your stove fan and/or open a window to help even more. Note that while the manufacturer specifically warns against using the 1600 outdoors (including using it in a garage), many users do keep them in their garages, mostly to get away from the kitchen smoke detector and the chance of setting it off, especially near the end of the roasting process. The Behmor 1600 coffee roaster is fairly simple to use. All you have to do is preheat the unit, load your beans into the roasting drum, select your preferred profile and start to watch and listen. Note that you don’t want to preheat for more than a minute and forty-five seconds, or the machine will assume you’ve begun roasting and won’t let you open the door! For this reason, we recommend preheating for no more than a minute, then turn the machine off, load the beans, select your weight and profile (or manually set the temperature), and proceed from there. All beans, regardless of where you get them from, go through a series of color changes as they roast. There are also two distinct sounds associated with roasting, referred to as the first and second crack. The first crack is a clear and audible signal that your beans are getting closer to getting done, and will be accompanied by marked color changes in the beans themselves. They will progress from green to yellow, to a honey brown, and then get progressively darker. The second crack is much less audible, so you’ve got to be fairly close to the machine to hear it. It’ll sound a bit like popping bubble wrap, but not quite as loud. Note that the 1600 was not designed to produce very dark roasts. So, if that’s your preference, then you’ll want to get a different machine. This one should not be used for more than ten seconds beyond the second crack. In any event, when the preset program completes, the machine will enter cooling mode. Or, again, if the beans reach your desired color prior to the completion of the preset program, you can interrupt the process and force it into cooling mode by manually overriding the program. Safety features built into the device will prevent you from opening the door of the unit before the beans have had some time to cool. 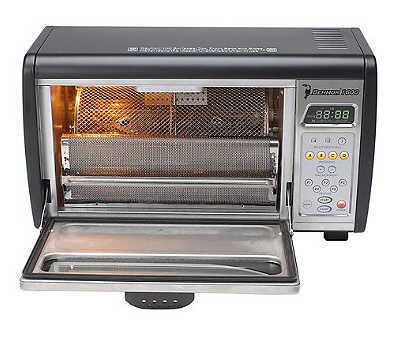 The manufacturer’s recommendation is that after every five roasts, you need to perform a few routine maintenance tasks, including doing a dry burn and general cleaning of the interior of the device. Essentially, this amounts to letting the drum run empty, completing a quarter pound roasting cycle with nothing in it, then gently cleaning the interior after it cools down with a non-caustic, non-abrasive cleaner. Don’t forget to unplug the machine before cleaning! Approximately every four months, it is recommended that you clean the DC fan’s impellor chamber too. You can access this by removing the six screws holding the right outside panel in place and using canned air, like you’d use to clean the interior of a PC. Note that performing this step is perfectly fine and will not void the product’s warranty! Consistent roasting results (as long as you don’t overload the machine). There are, however, some potential drawbacks to be aware of. The first is the fact that while the window on the door of the unit allows you to watch the beans as the roasting progresses, it is somewhat darkly tinted and smallish in size, which makes it a bit difficult to see what’s really going on. That’s not necessarily a deal breaker. After you’ve used the machine a few times, you’ll adjust to this. The other thing to be aware of is that while the machine does have a chaff management system, it’s less than ideal. The 1600’s chaff management system takes the form of a collection tray that sits beneath the roasting drum. As the individual beans begin to crack, the outer skin (the chaff) comes off and falls through holes in the roasting drum. Or at least that’s the theory. In practice, not all the chaff winds up in the tray. Some of it stays in the drum, and some winds up collecting on and around the door hinge. So, when you open the door after the beans have cooled, you’ll end up getting some chaff on your countertop, requiring a bit of cleanup. One final potential negative to be aware of is the fact that this machine uses electricity, rather than gas. It’s fine for day to day, casual use, but experienced home roasters tend to prefer gas for the same reason that professional chefs tend to prefer gas stoves, rather than electric ones. While none of these drawbacks are deal breakers, it does position the machine more toward beginners and casual home roasters than coffee purists who are looking for maximum control. And that wraps up our Behmor 1600 review. Our view is that it’s a great machine overall, and an exceptional choice for novice home roasters. Although, we note that as you gain experience, you may find yourself chafing under its limitations. Chiefly due to the fact that it’s not capable of producing very dark roasts, and offers somewhat less in the way of fine-grained controls than gas-powered machines. All in all, though, we strongly recommend it for broad swaths of the market. You’ll love its relatively high capacity, ease of use, and consistent results. Coffee Roasting Essentials: A Guide to Rate of Rise. Perfect Daily Rind. Coffee Bean Roasting Terms. Home Roast Coffee.